Value priced below the market average! 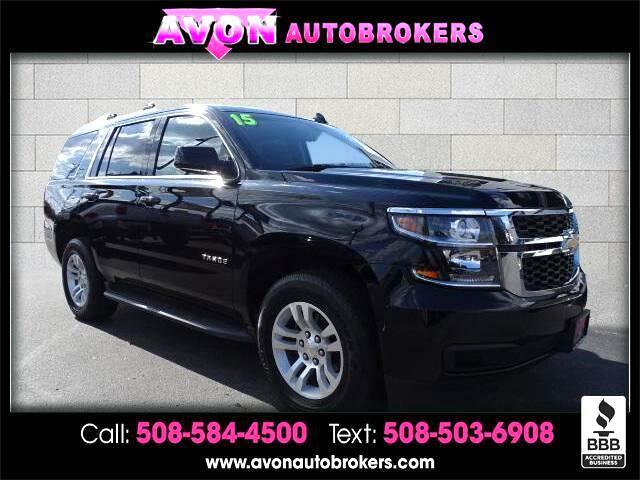 This 2015 Chevrolet Tahoe LS, has a great Black exterior, and a clean Jet Black interior! This model has many valuable options -Backup Camera -Bluetooth -Satellite Radio 4-Wheel Drive -Auto Climate Control -Security System -Parking Assist -Power Locks -Keyless Entry -Power Windows -Rain Sensing Wipers -Steering Wheel Controls -Cruise Control -Running Boards -Towing Package -Leather Steering Wheel Automatic Transmission -Tire Pressure Monitors On top of that, it has many safety features -Traction Control Call to confirm availability and schedule a no-obligation test drive! We are located at 159 Memorial Drive Rt.28, Avon, MA 02322. Avon Auto Brokers has been in business for over 30 yrs, owner Dana Nessen takes pride in his customers complete satisfaction. We specialize in high quality pre-owned vehicles of all makes and models . We have over 300 hand picked cars, trucks, minivans, SUVS priced thousands under Kelly Blue Book, NADA and Edmunds retail values. Message: Thought you might be interested in this 2015 Chevrolet Tahoe.